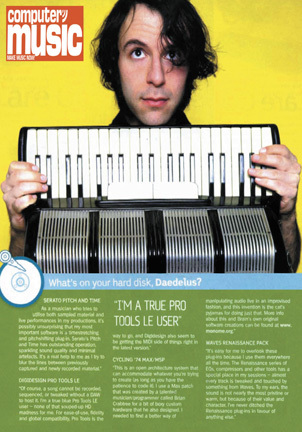 WHAT'S ON YOUR HARD DISK, DAEDELUS? "As a musician who tries to utilize both sampled material and live performances in my productions, it's possibly unsurprising that my most important software is a timestretching and pitchshifting plug-in. Serato's Pitch and Time has outstanding operation, sparkling sound quality and minimal artifacts. It's a real help to me as I try to blur the lines between previously captured and newly recorded material." "Of course, a song cannot be recorded, sequenced, or tweaked without a DAW to host it. I'm a true blue Pro Tools LE user - none of that souped-up HD madness for me. For ease-of-use, fidelity and global compatibility, Pro Tools is the way to go, and Digidesign also seems to be getting the MIDI side of things right in the latest version." "This is an open architecture system that can accommodate whatever you're trying to create (as long as you have the patience to code it). I use a Max patch that was created by a talented musician/programmer called Brian Crabtree for a bit of boxy custom hardware that he also designed. I needed to find a better way of manipulating audio live in an improvised fashion, and this invention is the cat's pyjamas for doing just that. More info about this and Brian's own original software creations can be found at www.monome.org." "It's easy for me to overlook these plug-ins because I use them everywhere all the time. The Renaissance series of EQs, compressors and other tools has a special place in my sessions - almost every track is tweaked and touched by something from Waves. To my ears, the sound is not nearly the most pristine or warm, but because of their value and character, I've never ditched the Renaissance plug-ins in favor of anything else."